A Solution To The MAC’s Worst Nightmare? While the “MAC” is the undisputed king of small-school football in Ohio, it nonetheless can’t get out of its own way when it knocks out member teams from the playoffs before they even begin. In today’s blog, guest writer Dean Eversole shares a possible formula for improvement that’s right under the league’s nose. We’re pleased to introduce guest columnist Dean Eversole to the site with today’s blog page. A veteran observer of area sports for over a decade, Eversole is well-versed in the issues of area conferences and authored the 2008 book, “Tigerball”, a history of Versailles football under legendary coach Al Hetrick. 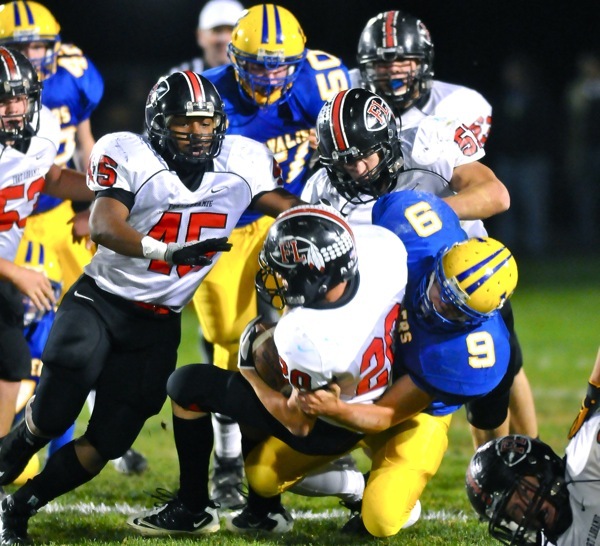 Like it or not, the winds of change are reshaping Ohio High School football conferences. Out are the small, regional conferences and in are the super-conferences. But, in West Central Ohio, there is one conference standing firm, at least for now; the Midwest Athletic Conference (MAC). The MAC is the undisputed king of small school football. Founded in 1974, MAC football has been nothing short of amazing, creating a stunning chain of successes and a deep-rooted sense of tradition. Originally, the league schedule required seven conference games, until 2001 when Versailles joined, creating an eight game schedule. Along with Versailles and success on the field came scheduling headaches, with each school playing a midseason non-conference game. The solution to remedy the nightmare was another invitation, this time to Anna. Unlike Versailles, the Rockets are football only MAC members. In 2006, the conference went to a nine game schedule. Problem solved, sort of. Almost instantly it was realized the MAC was doing something the rest of the state struggled to accomplish; knocking each other out of the playoffs before they even began. The complaints started flowing, and like a bureaucracy struggling to fix a problem the league searched for a remedy of the original scheduling problem. Utterly confused? Hang in there. A system was designed for an eight game league schedule, with each team dropping a league opponent. The process goes like this. Every two years, league win totals are added up for each team. The top team then drops the bottom team, the second team the ninth place team, etc. The concept is to allow for a week two non-conference game and an opportunity to earn computer points. The playoff problem has been alleviated to some extent. Last year a 7-3 Coldwater team and an 8-2 Anna squad both comfortably made the playoffs. Minster also qualified at 5-5, so yes it has worked. But now the league is back to where it was in 2002, struggling to secure two non-league games. Marion Local is playing another Canadian team, their second in three years. Delphos St. Johns was nearly forced into a nine game schedule, but eventually signed a deal with Detroit Central Catholic. Scheduling a MAC team is not high on anyone’s list around the state and now the scheduling nightmare is back…again. After nearly a decade of back and forth, the obvious solution remains the ignored solution…expansion. Two perfect candidates for the MAC have been floating around during this entire dance, Sidney Lehman and Ft. Loramie. Lehman has applied once and Ft. Loramie knows down deep that competing against MAC schools is the next step. The concept is as follows: Large School Division- Versailles, Coldwater, Parkway, Anna, Sidney Lehman and St.Henry. Small School Division- DSJ, Marion Local, Minster, New Bremen, Ft.Recovery, Ft.Loramie. Although Lehman currently competes in D-VI, the potential for rapid growth is there so they go into the large-school division. Loramie joins the MAC in the small school division. This will create two six team divisions. That would leave five divisional games and five slots open. Two of these games would be cross over games, leaving three non-conference games. Theoretically, a team could play a ten game MAC schedule or they could find three non-conference games, if possible. The system allows for both scheduling flexibility and max computer point opportunities. All this sounds great and it also seems so easy to accomplish. Well, not so fast. Change in MAC land is as welcomed as a ground hog in a soy bean field. The MAC is comprised of small, farming communities where tradition is held in high esteem and change is seen as a threat. It is understandable to see where objections may lie with expansion. After all, many will say the MAC isn’t broken so why fix it. True enough, but two major problems continue to rear their ugly heads, scheduling and computer points. A divisional set up solves them both and ends the vicious cycle MAC athletic directors are currently running.